Well said mate. I really see the belts to black as markers in your apprentiship. Finishing them signifies competence and then allows you then the right to push on an attain mastery. I felt so comfortable in my other belts after a year or so. You know, when that belt looses its stiffness, wraps itself around your waist comfortably before training. Man, this black just doesn’t play by them rules. What black has allowed me to do is realise how much I don’t know. I think that it is the real start of the journey once you have the realisation just how big the mountain is, like climbing through the clouds to see the real peak!! And as far as being tested, that is every second of every roll. And that is gold. As we are on the topic of fingers, an Avulsion Fracture occurs when the ligament tears out the fragment of bone that it attaches to. 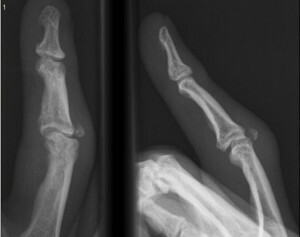 The little grey lump near the second knuckle is the fragment of bone that the tendon has torn out. Caused by an over under pass from half guard, and the opponent turned to their knees. Splinting and therapy for about eight weeks to recovery. Still a couple of degrees range of movement missing, but it works well otherwise. When I first started BJJ, there was only two blue belts in the whole state (that I was aware of). The access to coaches and technique was somewhat more limited that it is now and it took me around four years to get my blue belt. That belt and every belt since, I have felt I was not ready for. Not ready to bear the load of the responsibility of representing that grade, not ready for the onslaught of lower belts looking to get a scalp, and not ready to defend against others already at that grade that I looked up to and respected as proficient and skilled fighters. As I have said so many times in regard to BJJ, “You can and will be tested, every time you get on the mats”. There is nowhere to hide, not on past achievements, and not on the rank you wear. A coach I once had, had a saying, “You don’t earn the belt, you become the belt”. This rings true to me. You are not being awarded an achievement certificate, as congratulations that you have past some test. You are being recognised as having climbed a mountain, and this is our vote of confidence that you are now ready to begin the journey of climbing the next mountain. On the issue of tips (or degrees as they are called in the IBJJF Grading System). 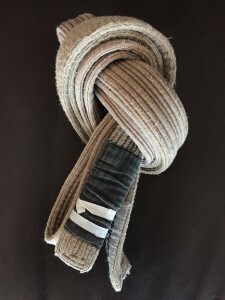 The difference between a white belt and a four stripe white belt is magnitudes apart, whereas the difference in purple belts may not be so striking. I was thinking back to when I had my brown belt, and only ever remember having a single stripe on it, so I went and dug it out, and found that it had two. This didn’t stop me progressing to black belt (incidentally that took about three and a half years from brown). Don’t be too worried about stripes as you progress through the belts, as all too soon you will have that vote that you are ready for your next mountain. Well, lets start off simple but with something really common. Fingers are injured so often in BJJ and many times if we think they are dislocated we just pull on them till they ‘clunk’ into place. Hey, that’s not a bad option. To do this you have the person sit in front of you on the ground, and you gently grasp the end of the finger. Now just tell the person to take the weight slowly on their finger and you slowly match the resistance. Its really quite deceiving, but you usually need quite some pressure even to put back the very small end (distal phalanx) of the finger. There really should be no pain, and actually relief when the joint pops in. They should then be able to move it with some ease and it should look and feel normal. From there its the usual sporting injury care. 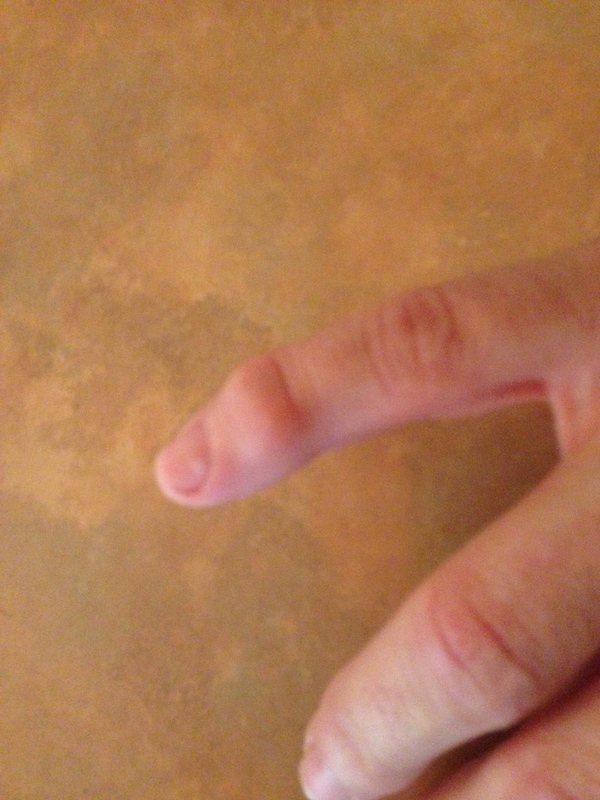 But, one thing though to watch out for is mallet finger. This is where the tendon tha make the finger extend is torn either partially or fully. Left untreated this can cause lifelong trouble, especially if its your dominant hand (bye bye ezekiels!!) Its usally easily fixed with a Mallet finger splint . For more info check out Mallet finger treatment. Happy choking!! So, as I sit here sipping on a glass of red, nursing my sore, arthritic knuckles from a hard day’s training, I have to wonder, what makes any Barossa Shiraz so awesome?….. The producer, the geography, the climate, the soil… ahhh, that’s right, the Terroir!!!! And how does this relate to Jiu Jitsu? Well, I’m not sure…. but then when it comes to BJJ, there is a lot I’m not sure about… for instance, what would make sane, intelligent people step onto a mat and choke each other for fun. What possesses us, day after day, to commit to the acid test that is an open mat, where everyday your ego is checked, when, in every session you can and will be tested. Why, when off injured, you compromise your recovery to just ‘play’. The enjoyment as 2 grown men stand, drenched in sweat, bruised and sometimes bloodied, after sparring for 10 minutes, face each other and smile a genuine smile and then… hug! What about the frustration that comes with trying to explain this martial art, sport, hobby, past time, religion, obsession, life style, family, to someone who doesn’t train. It truly is a conundrum. People talk about it being an emotional roller coaster, the highs, the lows and everything in between. But in the 15 or so years that I have been training in BJJ, it has never got any easier. In so many ways it gets harder, especially once you get that coveted black belt strapped around your waist… Thanks for that Mr. Robert Drysdale! Anyway, I digress, this blog is about the journey. I am blessed with the people I have around me, the friends that teach, test and mould me, the gym that is my church, and BJJ that is my religion. So lets try and figure out the essence of why we do this, lets talk about what works and what doesn’t and why, let us observe and report on training methodology (both conventional and un-orthodox), lets throw in health, fitness, performance, nutrition and technique, lets try and work out the terroir that makes Jiu-jits so special to us all…. Great to see a post about weight and training. I guess for us three the main goal now is to keep on the mat. Quite funny how priorities change, but thats the journey eh! We will really get into this more with specific plans for injury as time goes on. However, this is really the guiding philosophy. So often fighters will end up with an injury (insert anything really), but will will keep it simple and say left knee. Ok, so when you see these fighters at the gym/shops/bar they are really likely to tell you how bad their injury is and that’s why there has been no training. Well, the news is that there is plenty of body and one highly organised brain strapped around that knee. There is always so much more you can do and the combinations are endless. One I like is come down to the rolling/training sessions and do push-ups and chin-ups while your teammates rest, and then watch the roll. Your now training a body part you may not usually train, your inspiring your mates and every roll you actively watch you learn something!!! Any how, think up your own deadly combo and trial it. Doesn’t need to be crazy, even the above with 6 chins and 10 push-ups adds up over a session. Injuries are an advantage. They allow us refocus if we choose to, and just get stronger. If you want to track your overall health and performance, and in particular avoid over-training, what should you measure? What device should you buy to give you insight into when you should push harder, and when you should really just rest up. Over the years I have tried tracking a number of metrics. Heart Rate Variability (HRV) is a popular metric, that is supposed to give you a good overall picture of your readiness to train. I have also tracked CNS score, reaction times, resting heart rate, weight, sleep quantity and quality. After tracking HRV with a dedicated OmegaWave device, and other heart rate monitors such as the Polar H7 in conjunction with various apps, I am yet to be convinced the results are consistent with my ability to perform. I think one of the worst metrics is weight. If you are competing in a sport that you must fit into a weigh category, then it is obviously important, but as to your general health lighter is not always better. It is easily affected by hydration levels and glycogen depletion. I have been between 73 and 90 odd kilograms. When I was at 73 kilograms, I was thrashing my body with long arduous training sessions in excess of two hours, and restricting my calorie intake significantly. This lead to an extended period of 12 to 18 months to recovery from the over-trained state I had put myself in. This morning I’m 77.3 kilograms after six weeks of high fat, low carb diet with no calorie restriction and trying to keep additional training outside of Jiu-jitsu to high intensity, low duration to minimise the amount of recovery needed. The two metrics that I see reflect the progress of my training are reaction times, and resting heart rate. As my Jiu-jitsu volume and intensity increases in preparation for competition, I see my reaction times generally trend downward. When you feel faster, it’s because you are faster. For me, resting heart rate is the key metric that shows me the state of my recovery. When it starts going up, I start backing off. When it stays low, I know I’m good to keep pushing. I try to maintain the integrity of the measurement, by using an accurate measurement device, and having a consistent environment to take the measurement.